Anella is a family owned and run winery that values and respects tradition and the environment. Their vineyards are located in Fuentelcésped at approximately 2,800 feet altitude. 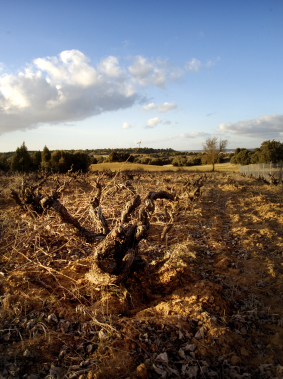 Their limestone rich soils provide excellent growing conditions for the native Tinto Fino (Tempranillo) grape. About 70% of their vineyards were planted in 1995-1999, while 30% are old vines, including some ungrafted pre-phylloxera small plots (the oldest one is from 1865). The winery practices biodynamic farming. The grapes are hand-harvested and allowed to ferment spontaneously with the native yeasts from the Estate. Anella’s winemaker, Isaac Fernandez, has been making award winning wines for more than 25 years. No winemaking additives are used. Fermentation takes place in concrete tanks (10,000 L) and French oak vats (8,000 L). Aging is done in concrete or French oak barrels, depending on the wine. All the work at the winery is done by gravity, without any pumps or pipes. Sulfite levels are extremely low (32 mg/L) and the wines are very lightly fined or filtered.